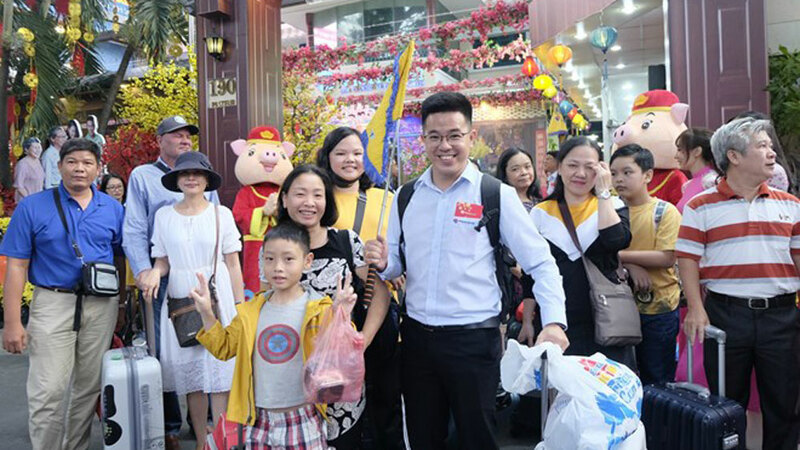 A group of tourists prepare to begin their trip on February 5 in HCM City. It is forecast that the number of tourists booking Tet tours organized by TST this year increased 10 percent compared to the same period last year. Meanwhile,the Sai Gon Travel Service Company (Saigontourist) has organized half-day and one-day tours for foreigners who want to enjoy the Tet atmosphere of Vietnam in HCM City, and Mekong Delta localities. The firm plans to welcome 3,500 visitors, mainly from the US, on Luxury cruiser Celebrity Constellation, which will dock in Chan may port in the central province of Thua Thien - Hue on February 9. The Vietnam National Administration of Tourism (VNAT) under the Ministry of Culture, Sports and Tourism, and the Vietnam Post and Telecommunications Group (VNPT) launched the tourism application Vietnamgo in the northern province of Quang Ninh on January 16.